Chapter 11 - Truth - "Chapter 11- Page 9"
Phew, let’s get to it huh? See if you can find our friend PK in the crowd? Apparently one of my significant others doesn’t appreciate the Cienoran’s shoulder pads. They’re a mark of status! Only representatives and other honored-type people in Cienora get shoulder pads. First you get a cape though. $10 patrons might be able to figure out who Kasen’s blessed by- it isn’t Kepho. $1 patrons got this page Sunday night! Vote incentive is a sketch panel from next page. Zerin: We hope you’ll all return on less official matters. The people of Cienora owe you all a great debt. Luxa: We were happy to help. 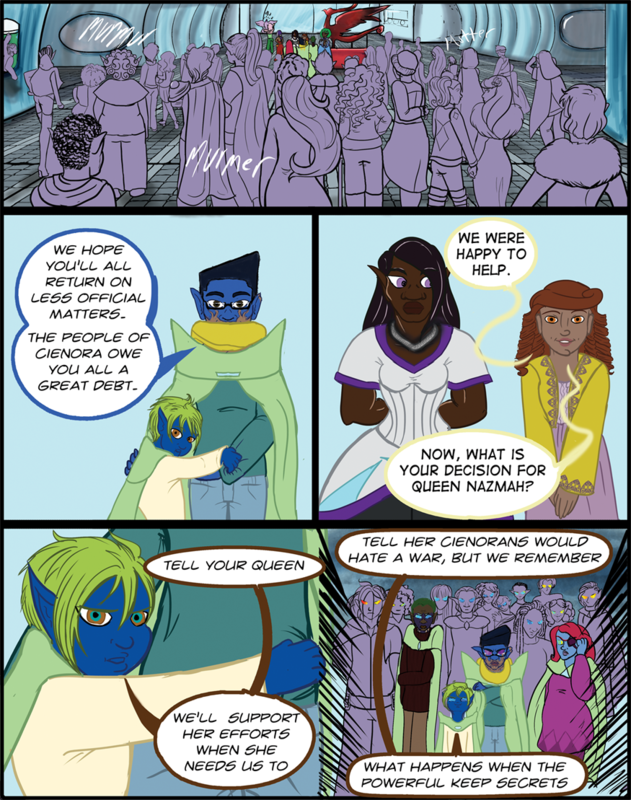 Now, what is your decision for Queen Nazmah? Kasen: Tell your Queen We’ll support her efforts when she needs us to.